Oraine Barrett - Certified Personal Trainer, Fashion Model and Soul Artist Management. work in tandem with the muscular system." Growing up my life was surrounded by fitness both directly and indirectly. Going to the farm with my mother at a very early age and helping her to farm was part of my daily routine. On top of that, my days were filled with unplanned physical activities with my community friends. We would play cricket, take a break for lunch, and went back to playing some other sport. Nothing would be able to keep us from running around all day. Our main priority was sports. The Progressive Integrated Alignment System (PIAS) came into existence after a lot of research in finding ways to ensure that clients are trained simply from the ground up with maximum effort and intramuscular and intermuscular coordination. Due to the many demands of life, today's population has been forced to be more sedentary than ever before. Society makes it challenging to prioritize health and fitness. "Hard work always pays off, when you put your mind to it." When I train my clients, freedom of expression is a priority. Communication with one another is the key to successfully achieving one's goal. Committing to training, and beginning a fitness journey, can be intimidating and overwhelming. That is why I believe in "speaking the same language" with my clients and concentrating on the idea of simplicity when creating and teaching my programs. Creating programs for specific groups takes time and thought. Communication with a client is a key component to creating the right routines tailoring to ones limitations and/or needs. It is important to get as much information about a particular client or group of clients. When training with me, you will begin with a fitness assessment, which will gather measurements of your fitness level at the start of the program in order to successfully train and follow a variety of workouts that suit you as an individual. I have been training with Oraine for 3 years and am in the best shape of my life. He is positive and committed and passionate about fitness. He has worked with me to achieve my goals of getting toned and strong. He has taught me to focus on my movements and to slow down. Oraine has helped me to improve my athleticism and flexibility. He has worked with me on my balance and strengthening my core which were both lacking when we started working together. As a result my body looks and feels great and I have built a healthy and toned body. "Consistent work is the foundation to achieve optimal performance." 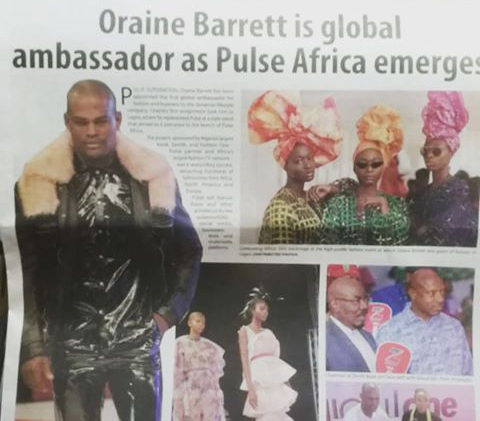 Oraine Barrett featured in Jamaica Observer, plots new path. strong discipline an good mental health."